We were extremely lucky to have a beautiful weekend for our annual Harvest Festival. The sun shone and the garden was busy. We had all sorts of activities and events as part of the Festival, one of my favourites being the Community Gardens Produce Show. The produce reflected the wonderful places that community gardens are and the hard work put in by volunteers and staff, it was an impressive show. 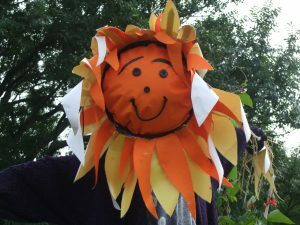 There was another important vote going on over the weekend too and I can now formally announce that our beautiful scarecrow has a name – as decided by the visitors she is called Mrs. Popple. Food was very much the theme of the day and as well as tasty preserves and foraged fungus there was lots of cake. Chocolate and beetroot, carrot and courgette cake all featured at the Community Allotment Tea Party. By popular demand the recipe for the courgette cake can be found below. 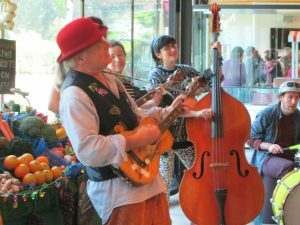 Huge thanks to all those that took part, from community growers to beekeepers to top musicians, the Barrow Band there are too many to name! For those growing their own courgettes here’s a way to make a small dent in the seasonal glut. Actually it is a very small dent, but it does justify eating cake and the grated courgette seems to make for a nice texture. Prepare two 20 cm (8 inch) round cake tins with butter/oil and baking parchment. Soak sultanas in warm water to plump up. Leave for a few minutes then drain. Clean courgettes (just a wipe should do). Trim ends but leave skin on. Grate (coarse not fine) and put in a sieve to let any excess moisture drain away. Put oil, sugar, egg yolks and juice of half a lime into a bowl and beat with whisk (or electric mixer) until creamy. Mix in grated courgettes and, sultanas. Combine flour and raising agents and sift in. Gently mix together. In a separate bowl whip egg whites to soft peaks. Gently fold into the cake mixture with a metal spoon. Split the mixture between the two tins. Put in preheated oven and bake for about 30 minutes until lightly browned and firm to the touch. Allow to cool in the tin for a few minutes then remove to a rack to cool completely before adding assembling or icing. To prepare the icing/filling: Beat together the cheeses and sugar together with some lime juice. Take care not to add too much lime juice and make the mixture too sloppy. Stir in the lime zest. You can either: Assemble one cake on top of the other with some of the cream cheese mixture between and then on top or make up two cakes. Give one away or freeze one for later. Slivers of courgette can provide a good way to decorate the cake. Use small young ones for the thinnest and most edible skins.